Whirlpool Estate One Speed Automatic Washer. 1/2 hp, 7 cycle, 110 volt machine. This washer is top-load machine with a double action agitator and self-cleaning filter. This machine is approximately 5 years old and has given me no problems whatsoever. It has three settings for the type of wash/rinse cycle to use - Permanent Press, Normal or Gentle. Load sizes are Small, Medium, Large and Extra Large. There are four temperature settings for each cycle. My model is white and is very solidly made. The top door hinges well and tilts back to a safe angle for easy loading of the drum. Adjustable plastic feet at the bottom insure proper leveling of the washer prior to start-up. I have found no walking across the floor even when it has been loaded improperly. It is a very quiet machine as well. The only slightly unpleasant noise is when the machine cycles from Rinse to Spin mode. For the Spin cycle, the rotational drum speed needs to be increased substantially. The motor is engaged to the drum after the motor has reached a pre-determined speed for the Spin cycle. An abrupt clutch clank can be heard for a second during engagement. Otherwise, a very quiet machine. Drum size is very good tho it could be a tad larger. A maximum load might be a blanket and perhaps 3 pair of slacks. Time for completion of a load is approximately 20 minutes going from Wash to the end of the Spin cycle. Just a great machine and I would buy another just like it. - Abrupt clutch clank at beginning of Spin cycle. - Drum size could be larger. An overall rating for this washer with 5 being the maximum would be 4.
i have a Whirlpool Estate ETW4300Q0, and for nothing good i can figure out how to clean the lint from within it....i have it for over 6 years, best machine by far...please help....right now i have to re-wash some clothes because of lint/ dirt patches shows up on clothing!! are YOU freaking kidding me?!? there is absolutly lint traps in washing machines-the Estate has a self cleaning filter but most do have removable and washable lint traps. knowledge is a beautiful thing when trying to make someone look like an idiot on the internet. little research maybe next time ??? WHERE IS THE LINT FILTER? Has anyone ever figured out how to get to the "self-cleaning" lint filter so they can clean it? This washer leaves so much lint on clothes and linens that I'm going to have to replace a working washer in order to get clean clothes! Had one 10 years!! Good machine but, transmission started to leak and a bolt holding trans. up was stripped! Just purchased a newer model of the one we had, new one, ETW440WQ. Tub only gets 1/3 full for the rinse and the clothes are a twisted up mess!!! The delicate cycle isn't!!! Goes like mad, stops and goes like mad again and repeats itself!! We are not at all happy with this machine!!!!!!!! I have owned my washer since October 2002 and today is the first time i had a problem with it. It will advance from washing to rinse, but will not drain and will not spin. I dont know how to correct the problem. (1) check the lint filter. But I cant find it. (2) check the lid switch. But I cant find it. (3) the agitator will not agitate when the lid is open. But mine is agitating with the lid opened. I have enjoyed the washer for almost 9 years and would like to keep it. I need help. I read that the Estate Washer DOES have a lint filter, and I, too, am need of assistance in finding and cleaning this "self-cleaning" lint filter. The rust started inside the lid at the bleach dispenser. Now it is spreading to the front of the washer and around the top. Must be very low grade steel or poorly painted. Going 15 years with my Whirlpool Estate washer just like this one. Not a single problem to date. Looking for something new for our new home. Nothing is impressing me. by: Please tell me you are joking...!!? There is no lint trap on a washer. I like this washer...but does anyone know where the lint trap is located? 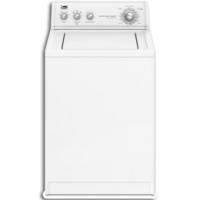 I have had mine over 5 years and its always been a great washing machine with no problems. We have owned our Whirlpool Estate washing machine for twelve years. There have been lots of changes in our lives over those twelve years but this washing machine has stayed the same - reliable. It has been through six moves and still works great. Well, seven moves it you count the very first one. It was purchased in Michigan and brought down to Indiana as a wedding gift. What a great gift it has turned out to be. It has lived in an apartment, a trailer, and best of all a construction site! We drywalled, laid flooring, painted, and all of the normal house building stuff around it. It also looks great. I would never know it was twelve years old by looking at it. There are no scratches on the outside. It still has it's beautiful white finish. We have four wonderful boys so it has washed mud, shells, crayons, sidewalk caulk, rocks, legos, pretzels, chocolate, etc... There are no marks in the inside. There was even one time that our cities water tower was being cleaned and put rust in our water. Before I knew it I had a very rusty colored load of laundry. We used rid out and rewashed that load and even the washing machine was back to its nice normal color. It has been the most reliable, durable washing machine that I know of. It is actually the only one we have ever owned and we are hoping it will last a few more years. Our ten year old has been learning how to do the laundry and has been able to use this machine. It is a very simple design with easy knobs. This particular washing machine, since it is twelve years old, is a top loading. The directions for washing are right there on the lid when you open it. That is a very nice feature. Another nice feature to this washing machine is that it is a heavy duty, super capacity washer. The older my boys get, the bigger there clothes get and the more loads I have to do. Our Whirlpool Estate washing machine has served us well. We love it and when the times comes to get a new one, it will probably be a Whirlpool! I bought the Whirlpool Estates about a few years ago now. My wife and me looked at a few places before we found them. We had looked at sears at their retail location and even their outlet store also. We looked at other major retailers such as Lowes and Best Buy but we really couldn’t find anything that we really liked to fit both a budget and have good quality. So after some research on the web we found something from whirlpool that looked to be what we needed. We have a family of five so laundry was something we needed to last a very, very long time to go thru three boys. We ended up with the estates by luck I guess you could say. We visited Sears one last time and they had them on sale or scratch and dent I cant remember the exact sale they were on. We bought a white pair the Washer is a heavy duty four cycle Washer and the Dryer is a three cycle Dryer. The dryer is simple to use if you have a small load or large you just set the timer and push start the lint collector is right on top easy to get to and remove. You just brush off the lint and replace easy as pie. The washer is just as simple you just chose what size load then hot cold or other and simple pull out the knob and it starts. I guess the hardest part was finding them we paid about 225 each and they are worth every penny I nor my wife have had no problems with them the washer is what we needed in size and the dryer is exceptionally fast. We need the time to be able to do more things for our kids. My washer is by no means a top of the line washer, I purchased it soon after I got married and just after entering the Air Force. I have had it for 12 years now. I have had to make some minor repairs, the water valve broke once, and the plastic water dispursing cup on the inside (where the water enters the bowl) broke once. I think the washer has held up astonishingly well the past 12 years, I would recommend this machine to anyone.